Grand Master Joe Lewis - the legendary world heavyweight kickboxing and karate champion - passed away this past August (2012) from a malignant brain tumor. In tribute to his memory, FightingArts.com provides this two part article on Joe Lewis's life, including a lost interview from 1981 during which Master Lewis reflects on the origin of kickboxing, his personal mentor Bruce Lee and the first televised world championships that launched international full-contact competition. Part I is an introduction to Joe Lewis's life (up until mid 1975). Part 2 is the lost interview from 1981. A young man quietly pops in from a nearby military base and melds into the crowd of 5,000 at Jhoon Rhee’s third National Karate Championships. He emerges onto the tournament floor in a black Okinawan gi (uniform) that suddenly heightens his Nordic good looks and Olympic physique against a seascape of white-clad contestants. Quickly assuming the stern demeanor of a Viking warrior, he explodes for the first time with unstoppable thunder in his side kick. It scores again, and again, and again, and again. “Because they can’t block it,” he explains. He wins his first national championship tournament with just one technique: the side kick. In subsequent tournaments, he would also unleash lighting in his backknuckle that instantly intimidates and, on the inside, fierce firebolts in his reverse punch that, later in the prize ring, would become the staggering jolts in his double hooks. Joe Lewis and Chuck Norris in their legendary third face-off for the Grand Championship at Ed Parker's 1967 International Karate Tournament in Long Beach, CA. An elusive Norris won this encounter, but Lewis won the final face-off the following year at Allen Stein's US Championships in Dallas, TX. His ferocious fighting prowess would dominate the martial arts competitive scene for the next decade. He becomes the first martial arts fighting champion featured on the covers of national newsstand magazines (Black Belt September 1967, Inside Kung-Fu November 1979). By 1975, he is inducted into the Black Belt Hall of Fame as “Competitor of the Year”. He briefly crowns his championship career as a Hollywood action lead, starring in AIP’s Jaguar Lives (1979) and American Cinema’s Force: Five (1981), before returning to his traditional karate roots as sage master and much sought-after seminar instructor. Influenced by Bruce Lee, he distills elements of classic fencing theory into “angular attacks” with innovative applications for tournament and full-contact competition as well as self-defense. By 1986, he is again inducted into the Black Belt Hall of Fame as “Instructor of the Year”. The once brash and colorful fighting champion, feared for his bravado and menacing physical presence, has become the reserved and sensible thinking man’s champion who changed everything. This legendary champion is Joe Lewis. 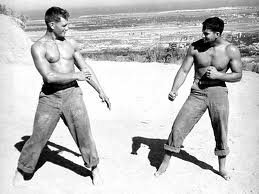 Joe Lewis (left) in Okinawa with his favorite marine sparring partner. Both inside and outside the arena, Lewis provided the essential spark that ignited a passion within the martial arts community for a contact sport that eventually spread around the globe. Certainly other prominent American martial artists, such as Bruce Lee, Maung Gyi and Count Dante (aka John Keehan), advocated and experimented with full-contact competition before Lewis. Also, after Lewis’ landmark ring championships, very many prominent behind-the-scenes promoters contributed to the evolution of a contact sport, among them sequentially Lee Faulkner (USKA), Aaron Banks (WPKO), Mike Anderson (PKA, WAKO), Tommy Lee (WSMAC), Don and Judy Quine (PKA), Chuck Norris (NKL, IKL), Howard Hanson (WKA), Georg Bruckner (PKA, WAKO), Joe Corley (PKA), Mike Sawyer (ISKA), Rorion and Royce Gracie (UFC), Art Davie (UFC), Rick Blume (Battlecade) and Dana White (UFC). But Joe Lewis - and Joe Lewis alone - made it all happen. He was the vital ingredient that brought together nationally-recognized championship competitors, quality promoters, large audiences, national print media and American network television coverage. In short, he provided credibility for the martial arts as a contact sport. He was both John L. Sullivan - the last great champion of the old way of doing things - and “Gentleman Jim” James Corbett - the first champion of the new way of doing things. For these ground- breaking accomplishments, he remains rightfully respected as the father of modern kickboxing and, by succession, of the current mixed martial arts movement. Joe Lewis kayos “Ronnie” Norman Barkoot in New York City, 21 January 1971. Raised on a farm in Knightdale just outside Raleigh, North Carolina, Lewis enlisted in the US Marines and was among the initial 16,000-man advisory force sent to Vietnam by President Kennedy in 1963. A year later, while stationed in Okinawa, he began Shorin-ryu karate training with Eizo Shimabuku, John Korab and Kinjo Kinsoku. He entered his first karate tournament in 1966, winning grand championships at Grandmaster Rhee’s National Karate Championships in Washington, DC, in both fighting and kata against a then-record 549 contestants who included many nationally regarded competitors. At the time, tournament light-contact karate was the only form of sport martial arts in America, and Lewis was not yet familiar with the rules. During his subsequent tournament career, Lewis won more than 30 major titles: In April 1967, Black Belt magazine ranked him America’s top tournament fighter in the sport’s first-ever top-10 ratings. 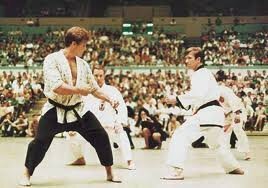 In November 1968, he won the World Professional Heavyweight Light-Contact Karate Championship in New York City. In August 1969, he won the first of an unprecedented three consecutive grand championships at Ed Parker’s celebrated International Karate Championships in Long Beach, California. 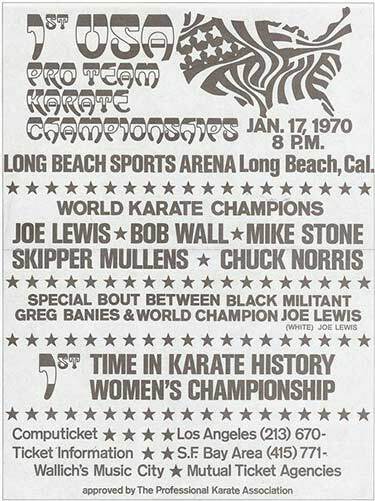 Together with Mike Stone and Chuck Norris, Joe Lewis stood among the “Big Three” great American tournament champions of the golden era in light-contact karate. Lewis proved preeminent. He was voted the greatest karate fighter of all time by his peers in an August 1983 Karate Illustrated survey of the world’s 23 top tournament fighters. Chuck Norris and Bill Wallace tied for second place. Despite his supremacy on the tournament circuit, Lewis continued to study and to refine his fighting technique. 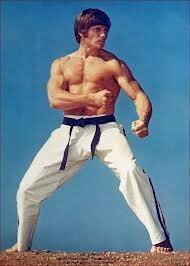 In 1966, he trained in Okinawa-te with Gordon Doversola and, in 1968, in Jeet Kune Do with Bruce Lee. Also, while briefly contemplating a career in professional boxing, he trained with former heavyweight contender Joey Orbillo, and even picked up a few tips from the famous “Sugar” Ray Robinson. However, his disaffection for the ambiguity of point karate’s scoring system, in combination with the proactive influence of these mentors, ultimately led to a longing in Lewis to prove that the martial arts could provide audiences with an exciting professional contact sport. 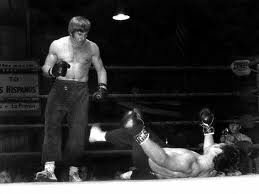 In January 1970, Hollywood stuntman-turned-tournament promoter Lee Faulkner agreed to headline the first full-contact kickboxing bout in North America as the main event on Faulkner’s Professional Team Karate Championships at the Long Beach Arena. Lewis knocked out Kenpo stylist Greg Baines in the second round inside a boxing ring wearing 12-ounce gloves. Although Lewis regarded the bout as “full-contact karate”, the ringside announcer referred to it as “American kickboxing”. The term caught on and immediately showed up in the May 1970 issue of Black Belt magazine. Lewis fought another nine bouts, knocking out all his opponents and catching the attention of The Ring (December 1970) and Sports Illustrated (April 26, 1971) magazines. Although several promoters began to add an occasional kickboxing bout to their tournament finales, traditional martial artists were scandalized by the new sport. Many regarded full-contact competition as equally demeaning to the spirit of the arts and degrading to the street lethal integrity of their techniques. Moreover few black belts were qualified to step inside a kickboxing ring because few trained like professional athletes. By 1972, Lewis had run out of opponents and noteworthy promotional activity gradually ceased. Poster from the historic first kickboxing bout in America. Notice that the initial name for sanctioning body was the Professional Karate Association. Afterwards, promoter Lee Faulkner changed the sanctioning name to the US Kickboxing Association. Then ABC-TV’s hit series Kung-Fu, starring David Carradine, followed by the theatrical hit Enter the Dragon, starring Bruce Lee, triggered a tsunami of public interest in the martial arts. Propelled by the warmer popular climate, Lewis began an effort to reboot the sport. He raised the notion of a televised championship with his karate student Tom Tannenbaum, an exec vice-president at Universal Television and onetime Bruce Lee student. Next, working with Lewis, Tannenbaum packaged the first World Professional Karate Championships to feature this now-renowned karate champion as a 90-minute late night network television special for ABC’s Wide World of Entertainment. Tannenbaum brought in veteran Wide World of Sports and Monday Night Football director Andy Sidaris to helm the television production, as well as sports broadcaster-turned-TV and movie star Telly Savalas (Kojak) to host the broadcast. He also secured on-camera audience appearances from Hollywood celebrities David Carradine (Kung-Fu), Lorne Greene (Bonanza), Jim Kelly (Enter the Dragon), Ryan O’Neal (Love Story), George Peppard (The A-Team), Peter Graves (Mission: Impossible), Peter Fonda (Easy Rider), Richard Roundtree (Shaft), Christopher George (The Rat Patrol) and special guest Linda Lee, Bruce Lee’s widow. Lewis, in turn, brought in Professional Karate magazine publisher and taekwondo black belt Mike Anderson to promote the live sports event. Anderson’s own black belt student Georg Bruckner, whom Anderson trained while stationed in Germany with the US Air Force, connected the promotion with Europe’s top tournament karate competitors. Anderson also formed the Professional Karate Association (PKA) with Hollywood couple Don and Judy Quine, who learned about the upcoming broadcast from their son’s karate teacher, Chuck Norris. Don Quine had been a series regular actor on NBC-TV’s The Virginian and on ABC-TV’s Peyton Place whereas Judy Quine’s father, Barney Balaban, had been president of Paramount Pictures. They lent the services of their pricey entertainment attorneys to structure the new sanctioning organization and to field any follow-up television deals. Perhaps not so ironically, “Professional Karate Association” was the same name promoter Lee Faulkner initially contemplated for the sport’s defunct original sanctioning body, the United States Kickboxing Association (USKA). The PKA’s World Professional Karate Championships took place on September 14, 1974, at the Los Angeles Memorial Sports Arena before an audience of 10,000 spectators. Joe Lewis won the heavyweight world title with a second-round knockout of Yugoslavia’s Franc Brodar. Jeff Smith, Bill Wallace and Isaias Duenas won, respectively, the light-heavyweight, middleweight and lightweight crowns. The event was telecast over ABC-TV on December 27, 1974, at 11:30 p.m. and attracted media coverage from major TV network news, Sports Illustrated and the Los Angeles Times. Lewis and his then-fiancÃ©e actress Barbara Leigh also made the cover of Playgirl (January 1975) magazine.